In view of the current attempt at rejuvenating its long-lost comparative advantage in agriculture, and perhaps in line with the expressed policy direction of President Muhammadu Buhari’s Administration in Nigeria, agriculture as well as agro processing and packaging in the value chain, once again, is being accorded a top priority in the nation’s dogged efforts at boosting the socio-economic fortunes of Nigeria and Nigerians. In regard to Nigeria’s making the requisite new investments in the agricultural sector, to ensure increased food production both for domestic consumption and export, President Buhari recently remarked that the Federal Government is well-determined “to significantly reduce the very high bill for importation of food products” into the country. The President, who reportedly made the remark during his latest bilateral meeting with the Prime Minister of Denmark, Mr. Lars Rasmussen, in Washington D.C., United States, stated that his Administration’s policy direction on reviving agriculture as a fundamental economic enabler, is part of the Government’s commitment to the rapid diversification of Nigeria’s economy, against the backdrop of the shrinking oil wealth. “We developed a mono-product economy and lost opportunities to diversify in the past. We have great potential for agriculture and solid minerals. We are now determined to exploit them to the full. Addressing the past neglect of these two sectors will help to reduce unemployment and make us a more productive country,” Buhari was quoted to have declared. We abandoned them for petroleum. Now, we have to go back, the President has declared. In view of this development, stakeholders in the export business, particularly, the packaging professionals, and other investors in the agricultural value chain have begun to re-focus attention on the need to get a piece of the action in respect of agro foods processing and packaging for export. Currently, agro processing consciously, has been identified as a key element in the agribusiness value chain, as stakeholders opine that as a promising foreign exchange earner, processing agro foods and other non-oil products for export is just the way to go. That is, there are attractive investment and job opportunities that could trigger sufficient food production for local consumption, and for export creating wealth for millions of Nigerians. 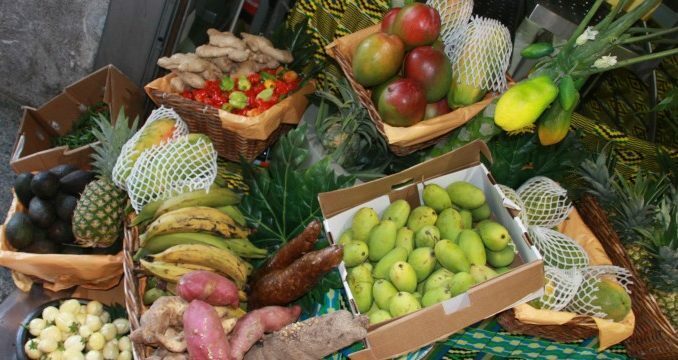 Thus, among other identified investment opportunities in the agricultural value chain in the country are fresh fruits processing, foodstuff retailing or grocery service, fish farming, herbs, flowers framing and gardening, livestock feed production, poultry farm, mushroom farming, frozen chicken production, and glasscutter farming. Potential agro entrepreneurs could also make useful investments in other areas, including snail farming, coconut juice production, beekeeping and honey production, plantain chips production, custard manufacturing, fruit juice or jam production, groundnut processing, cashew nut processing, soya beans processing, spices production, dairy products, vegetable farming. For instance, Mr. Sola Adeniyi, Chief Executive Officer (CEO), Natural Nutrient Limited, is reportedly taking advantage of this window of opportunity already. Adeniyi, who is an established agro entrepreneur and Moringa farmer, specifically focuses on Moringa and plantain, as his firm produces Moringa fruits from improved cultivars. On the need to generate wealth from agro processing, he reveals that Nigeria certainly faces the challenge of post-harvest loss. According to him, it is estimated that 40 per cent of crops, fruits and vegetables produced in the country become wasteful, with a loss predominantly resulting from post-harvest handling. One major effort to reduce food wastage, therefore, is right processing and packaging, he declared. Presenting a veritable opportunity to a broad spectrum of Nigerians and foreign investors alike to a make considerable investments and partake of the imminent fortunes in Nigeria’s renewed drive to exploit the economic benefits of agriculture and allied industries was the recent 3rd Annual Manufacturing Partnerships for African Development (mPAD) and Nigeria Manufacturing Expo 2016. The event was held at the Landmark Centre, Victoria Island, Lagos. It would be recalled that the three-day event was declared open by the duo of Dr. F.S.U. Jacobs, MON, President, Manufacturers Association of Nigeria, and Mrs. Omotara Awobokun, Director of Trade, Federal Ministry of Industry, Trade and Investment (tbc) and Honorary Guest on the occasion. The manufacturing Expo 2016, which attracted a great number of manufacturers, visitors, exhibitors, sponsors, partners, and investors across Nigeria and from overseas, was organised with a special reference to exhibition of several leading-edge technologies, new manufacturing machinery and tools for operational outcomes in especially food, agro processing, beverages, packaging, labelling and printing industries among others. According to the organisers, this year’s conference and exhibition has enabled many Nigerian manufacturers who attended and participated in the Expo to do an evaluation and acquire new manufacturing machinery, free training sessions, special events, business matchmaking, and social media, among other conference highlights and special events. All these were featured to further equip them in boosting local production, supporting job creation, stimulating the Nigeria’s socio-economic growth and development, and ultimately diversifying the nation’s wobbly economy. The Manufacturing Expo 2016, in the perception of several participants, has empowered them to participate in knowledge acquisition and sharing, coupled with beneficial networking sessions, which, in their opinion, could be a huge platform for sustainable growth in the Nigerian manufacturing industry in the nearest future. In terms of exporting his range of products to the outside world to add value to other consumers beyond the nation’s shores, Dr. Adedeji believes that the first thing the government can really do to encourage packaging of products for export from Nigeria is to begin to let the Nigerian manufacturers understand the importance of quality standards even in packaging. He also recommends that the Government needs to create more awareness for prospective agro foods exporters about certain regulatory rules that exist which they need to get certain certifications that would quickly expose their products to the global market. Adedeji lists such regulatory rules that could assist stakeholders in the agro foods processing for export as Quality Management System, ISO9001; Food Safety Initiative as well as the Global Food Safety Initiatives. “Once you have these certifications, your products become globally accepted. It’s almost automatic…,” he remarked. With regard to packaging such agro products for export, he says after processing, and regardless of how simple your processes have been, your packaging must be world-class. The essence of packaging, he stated, is that it protects the foods in the first instance, just as it makes them palatable, interesting and have a visual appeal. Similarly, Buhler’s delegates in an interaction with Nigeria Packaging at the Manufacturing Expo in Lagos, said that the overseas company with several offices around the world services clientele ranging from feed mills, flours mills to specialty-based products companies. According to Buhler, the Expo is the most significant as regards meeting new people, mostly new players in the market, new people that want to be introduced to the latest technologies so that they can also be profitable for the market in the future. In terms of products packaging, it is revealed that if one looks at every product, the quality can be of best quality. However, Buhler has observed that if somebody looks at such a product with his or her eyes, the person will be able to know the quality of the product through its packaging in the real sense of it. On practical measures to take in ensuring that “Made-in-Nigeria” products, including agro foods become acceptable in the international market, Buhler disclosed that at the beginning, the product has to be packaged well, and scientifically too, coupled with enough information on the product, not only the appeal. The right technologies for packaging should also be applied. The African Growth and Opportunities Act (AGOA), which was enacted by the 106th United States Congress, is originally formulated to authorise a new trade and investment policy for sub-Saharan Africa. It is also meant to expand trade benefits to the countries in the Caribbean Basin, renew the generalised system of preferences, and re-authorise the trade adjustment assistance programmes. The Act, initially, was designed to take effect in the year 2000. Though reports say that the fundamental purpose of this legislation is to assist the economies of sub-Saharan Africa, and to improve economic relations between the United States and the region, many African stakeholders yet say that the much-desired objectives of the programme have not been realised. Interestingly, after completion of AGOA’s initial 15-year period of validity, the legislation was reported to have been extended on 29 June, 2015, by 10 more years, till 2025. Hitherto, in terms of eligibility of African economies to benefit from the programme, each year, the United States President “evaluates the sub-Saharan African countries and determines which countries should remain eligible.” This eligibility criterion was purportedly introduced to improve labour rights and movement toward a market-based economy. In connection with the benefits derivable from inclusion in the programme by the United States, stakeholders opine that AGOA still provides trade preferences for quota and duty-free entry into the United States for certain goods, while expanding the benefits under the Generalized System of Preferences (GSP) programme. Despite sarcastic criticisms by many that AGOA is a one-sided agreement with little African involvement in its preparation, and as one dominated by “oil and raw materials”, others say that it has resulted in narrow successes in some African countries, including Nigeria. Besides, it has been observed that there is also a considerable growth in the textile and apparel industry. In view of Nigeria’s efforts at reviving its fortune in agriculture, as espoused by the Muhammadu Buhari Administration, agricultural products have been identified as a promising area for AGOA trade. Nevertheless, some stakeholders in the agro foods processing business state that much work, however, needs to be done to assist African countries in meeting the U.S. sanitary and phytosanitary standards, as a key requirement to access the global market. In a training programme titled, “Promoting Quality Melon and Oil Seeds for Export through Value Chain Approach’’ in January 2014, in Benin City, Edo State capital, the Executive Director/Chief Executive Officer of the Nigerian Export Promotion Council (NEPC), Mr. Olusegun Awolowo, in his opening remarks, had told the participants that there was a need to create awareness and training for the Nigerian teeming farmers/producers on the significance of producing quality exportable products. Why? Mr. Awolowo at the programme, had called the attention of the farmers to one of the pressing factors responsible for reported rejection of certain products from Nigeria in the international market. He specifically mentioned aflatoxins, which are a group of chemicals produced by certain mould fungi which are harmful or fatal to livestock/agricultural products and are considered carcinogenic (cancer causing) to animals and humans. Because of relatively poor processing and packaging, according to him, the World Bank as of 2014 revealed that nine African countries, including Nigeria, would have 64% of their annual export, such as agro products – nuts, fruits and cereals – valued at about $674million in trade annually, rejected in overseas’ markets. This was reportedly caused by mycotoxin contamination and other SPS related issues. Awolowo, therefore, stated that it was imperative and disturbing to realise that between 2003 and 2013, certain Nigerian agricultural products, essentially melon, groundnut, palm oil, beans, Ogbono (Irving Gabonesis) recorded high presence of aflatoxin. The disturbing development, he revealed, had resulted in the growing rate of alert notifications under the Rapid Alert System for Food and Feed (RASFF) from the European Union (EU) on some of Nigerian agro products. This has been with the “attendant loss in export revenue annually,” he disclosed. melon and groundnut, so that Nigeria can regain its comparative advantage in agriculture. In an attempt to facilitate access the global market, the NEPC boss stated that some aspects of Sanitary and Phyto-sanitary (SPS) measures should be considered by the participants on the monitoring and enforcement of the relevant regulatory and trade provisions. Research has shown that it is unquestionable to say that the agro industry everywhere has the capacity to absorb a vast amount of manpower in the primary and secondary levels of production. After harvesting, the processing industry can absorb a whole lot of manpower, thereby creating jobs for the unemployed and generating income for their livelihood. The agro processing industry equally promises to make a substantial contribution to Nigeria’s Gross Domestic Product (GDP) and manufacturing industry. It should be noted that majority of the inputs in the manufacturing industry are principally agricultural products. For instance, Rubber Latex is used as a raw material in the shoe and tyre industries. With the requisite knowledge, right certifications, and adoption of relevant modern technologies in agro foods processing, the Nigerian agro products industry can access and fully get integrated into global markets. This is important in that most of what Nigerians currently produce are said to be consumed within the country. Only a small fraction of it is being exported. In view of the dwindling oil revenue, just as the Federal Government of Nigeria gradually gravitates toward re-making agriculture the mainstay of the nation’s economy as of now, the agro products industry can well assist in improving food sufficiency in the country. More importantly, the Buhari Administration says it is determined to cut down on food imports receipts, saying aside from depleting the nation’s from reserves excessively, most of the food items being imported can well be produced by Nigerians, for Nigerians.